Time To Pet makes invoicing your clients extremely easy and in most cases is almost entirely automatic. For those who are accustomed to a more manual invoicing process, there might be a slight learning curve, and there are a couple of things to keep in mind. The Current Invoice bar (pictured above) shows the current invoice that any newly schedule services will be added to. The table lists all existing services that are already part of this invoice. Each scheduled service will have a corresponding line item in its invoice. The first time you schedule services for a client, we will automatically create an invoice for that client and add all of the services to that invoice. The next time you schedule services for the client, you will be prompted to select whether or not to schedule the new services in a new invoice or an already open invoice (An open invoice is any invoice for that client that has not been fully paid). Note that if the client does not have any open invoices, we will automatically create a new invoice, and you will not be prompted to select an invoice as the above image demonstrates. You can also open an existing invoice on the calendar for scheduling by click the “Calendar” link next to any invoice (for example, from the Invoice List found under each client’s profile). 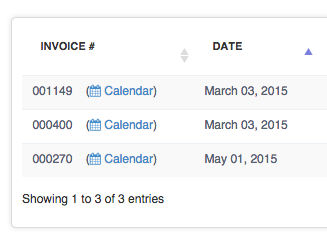 Invoices are automatically generated, but you can still manually adjust them with our built in invoice editor. You can manually adjust all aspects of each line item and add your own custom line items. Note: Manually adjusting a line item property (i.e Cost) that was generated from a scheduled service will prevent any automatic changes to that line item property should you later update the service. Although the situation is rare, it is possible to schedule services for a client without invoicing that particular service. 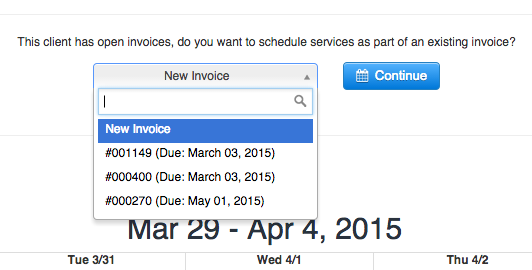 To schedule services without invoicing, make sure to check “Do Not Invoice These Services”. You will also receive a warning when selecting this option.